Iterable partners with Stitch Data to enable clients to export and replicate all their Iterable data in the data warehouse of their choice. This integration requires an Iterable account and a Stitch Data account. If you’re not already an Iterable client, request a demo to discuss how the Iterable and Stitch Data integration can work for you. Sign in to your Stitch account. Enter a name for the integration. This is the name that will display on the Stitch Dashboard for the integration; it’ll also be used to create the schema in your destination. For example, the name “Stitch Iterable” would create a schema called stitch_iterable in the destination. Schema names cannot be changed after you save the integration. Note that this particular URL won’t display in Stitch again once you click Continue. Think of this URL like you would your login or API credentials: keep it secret, keep it safe. You can, however, generate another URLshould you need it. The last step is to setup webhooks in your Iterable account. Sign into your Iterable account. In the Endpoint field, paste your Stitch-generated webhook URL. After the webhook is saved, click the Edit button on the far right to select the events you want to track. Your changes will save automatically. You’re good to go. After you’ve successfully connected your Iterable integration, Stitch will continuously replicate your webhook data into your data warehouse. Because Iterable data is sent to Stitch in real-time, this means that only new records are replicated to your data warehouse. Most webhook-based integrations don’t retain historical data due to this as-it-happens approach. This version of Stitch’s Iterable integration uses append-only replication. Append-only replication is a type of incremental replication where newly replicated data is appended to the end of a table. Existing rows are not updated; updates are added to the end of the table as new rows. Data stored this way can provide insights and historical details about how those rows have changed over time. If you simply want the latest version of the object—or objects, if you elected to track more than one during the setup—in the integration’s table (data), you’ll have to adjust your querying strategy to account for the append-only method of replication. This is a little different than querying records that are updated using updated_atincremental replication. If you didn’t define a primary key while setting up the integration, the primary key for the table will be _sdc_primary_key. In v1 of the stitch incoming webhooks integration, Stitch will create a single table—called data—in the webhook integration schema (this will be the name you enter in the Integration Schema field when you set up Iterable) of your data warehouse. Aside from the Stitch columns, the schema of this table will depend entirely on Iterable’s webhook API. With the exception of the _sdc fields, Stitch does not augment incoming webhooks data nor does it have any control over the fields sent by the webhook provider. Stitch allows you to generate up to two Iterable webhook URLs at a time. These URLs contain security access tokens and as such, have access to your Iterable account. 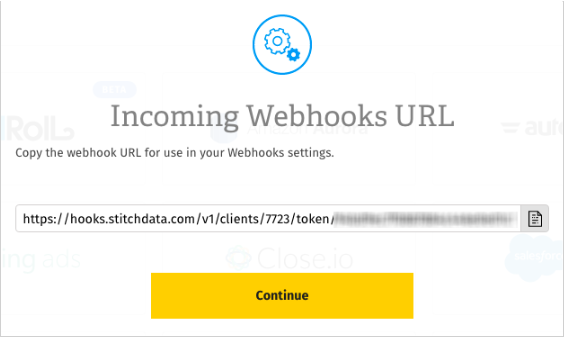 Follow the steps in the set up webhooks in Iterable section to update the webhook URL in Iterable. After you’ve updated the webhook URL in Iterable, click the Revoke button next to the oldest webhook URL in Stitch. This will invalidate the token and revoke access.